One of the best lines I heard in the past few weeks was “That train has sailed.” Combine that with a crazy schedule and we now have a SQL Crazy train that floats from event to event. I was able to present at Providence last year and I have been lucky enough to have been asked back. This year I will be giving two sessions, and they are the same sessions as last year. Let’s see how well we can do this year. I am looking forward to this trip. There are a few people I haven’t seen for a while on the east coast. This will afford me the opportunity to chat and network with these folks again. If you visit the event website, you might even catch a glimpse of the featured speakers. Here are some of the courses that stood out to me. Sadly, some of them are in direct conflict with my presentation times. Experienced DBAs know that SQL Server stores data in data files and transaction log files. What is less commonly known is that the transaction log file is broken up into smaller segments known as Virtual Log Files, or VLFs. Having too many VLFs will cause performance to suffer. And having too few will cause backup performance to suffer. How do you strike the right balance? In this more advanced session, veteran DBA Mike Hillwig will show you what VLFs are, how they’re created, how to identify them, and how to strike the right balance between too few and too many. In many organizations, there is a rift between DBAs and developers. The root cause is that there isn’t often an established framework between what the DBAs need to manage the data and what developers need to help solve business problems. Many DBAs think that developers just write code without considering the impact to the data. And many developers think that DBA means ‘Dont’ Bother Asking.” In this session for developers, veteran production DBA Mike Hillwig will help you understand the DBA’s needs in order to help you bridge that gap in your organization and work better to help solve business problems. DB Forensics 2 and Sebastian’s presentation are at the same time, so I will only be able to hit one of those two as well. So I have to ask. Will you be joining the SQL Crazy Train at our whistle stop in Providence? If so, come say hi and we can chat. Good news everybody. October 1st is no longer the day that the MCM was prescribed to die. 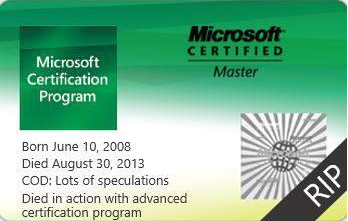 The Microsoft Certified Master is now on life support until December 31st, 2013. Which means that the Jan 1st (for any interested in New Years resolutions), the Advanced Certifications at Microsoft will have been terminated and any who possess the certification will instantly become myths, legends, and items of folklore. Ok so that last bit might be a bit of an exaggeration. Here is a screen grab from the Advanced Certification Site here. I added the nice red boxes and underline for emphasis. While this bodes well for those that had committed to training rotations, or who had committed to hours of study and only had the Lab Exam remaining, the program is still being terminated. Many are still unhappy. Many have moved on through the grief cycle. Polls have been taken, articles (here, here, and here) written and meetings held. In the end, Microsoft sort of acknowledged that they alienated a huge faction of their supporting community. Bumping the death date back to December 31st is a sign of that. I am happy that a meeting was held after the community outcry. It is far better than nothing at all. I am also happy that the date has been bumped back. I was not happy with the initial announcement and the manner it was done. I am not yet satisfied that Microsoft will do anything to promote a Master level with their products. In fact, as others have said (and I am sure many more have silently supported), I am uncertain I could advocate an advanced certification for Microsoft again. I am uncertain that I could support an advanced certification for Microsoft from a 3rd party vendor. Although the MCM has been removed as the focus point for learning goals, learning still goes on, and people will still aspire to make themselves better SQL Server professionals. Don’t give up learning – it’s always worth it. If you have passed your Knowledge Exam, I say go for the lab exam. Test yourself and see if you can tame the beast. If for nothing else other than to measure yourself and provide a bit of a self-evaluation. Don’t hesitate and leave yourself wondering if you could have accomplished that goal. I know one person that has been pondering if he should do it. He had been planning on attempting the MCM exams next year. Obviously the change from Microsoft has changed his plans and made him question the value of attempting. My advice to him was to take the exams, and especially now that the MCM is on Life Support. It is far better to attempt the exams (for those that are still on the fence), than it is to live in regret and doubt. Worst case, you fail the exam and have a fair amount of introspect that will happen because of it. Best case is you will pass the exams, be an MCM for life, and still have a fair amount of introspect that will happen because of it. My deadline is fast approaching. It seems these days that editors have no patience. On top of that there is this ever-shrinking deadline problem and the constantly shrinking lead-time to publication issue. 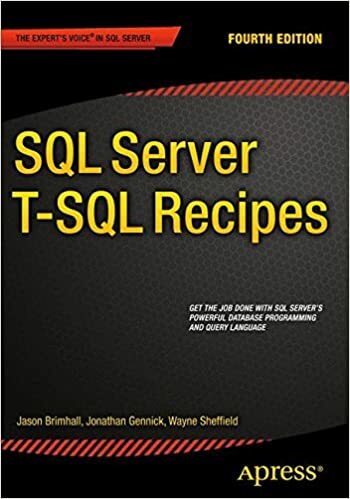 Oh wait, it’s only TSQL Tuesday. But the end of TSQL Tuesday is fast approaching, and I am cutting it close once again. This month we have been invited to this party by Rick Krueger (blog | twitter), and he wants us to talk about our hacks, kludges and wedgies. We are calling them Rube Goldberg Machines for this month. And a Rube Goldberg could be many different things in the SQL Server world. Heck, it could be many different things in the IT world. If you are unfamiliar with these types of devices, kludges, widgets, here is a good example from the folks at Mythbusters. My first inclination was to talk about a solution involving the use of SOAP calls in SSIS to perform batch credit card authorizations and then to do inventory control and process shipment orders. That was a fun project. It was also extremely successful compared to the previous solution. We went from a nightly 12 hour process to finishing in 1-2 hours for twice the orders. I then thought of a couple of solutions that involved the backup of a database on one server and then to restore the database on another server. Minimal moving parts there as it only involved the backup, restore, and then to re-assign permissions (e.g. prod backup to QA environment, the permissions should probably be different). And then it hit me. There is a pretty cool solution that involved multiple servers, multiple moving parts, and was somewhat useful. Imagine having three servers that each perform a different function. In our case, we will call them Server1, Server2, and Server3 – all of them are SQL Server. Server1 is the primary production server. Server2 is a mirror of Server1. And Server3 is the DR server that is a secondary in logshipping. Due to policy or previously established procedure, mirroring is stopped (maybe the deployment requires massive data changes and it causes issues with latency to the mirror. Maybe the network link between servers is broken and you want to prevent excessive log growth – it’s up to you to find the excuse). You already have a process for re-establishing mirroring and logshipping (yeah that got stopped too), but you want a 1-click approach. Without going into extensive details, what worked in my scenario was to create linked servers between each of the three servers. Then I could go and create a job relevant to each server (such as the steps listed below). Each job would then execute a job step and then start the next job in the sequence via the linked server – if the job step was successful. If it failed then it would fire off an alert to notify the appropriate people of where the failure occurred. Here is a sample of the steps that could be executed. Depending on the requirements, you may want to try something like this or do something completely different. Your mileage may vary. The point is, we have a little mouse trap here that triggers another mouse trap and then another until the task is complete. Hopefully the setup will require minimal intervention, if any (that is a requirement of a Rube Goldberg machine – you start it but don’t touch it after that). There you have it. Nothing big and fancy. Just a short and sweet description of a possible avenue for some of those multi-server tasks you may have. Are you ready for some SQL? If you are like me, you are probably almost always ready for some SQL. Well, we have just what you are hungry for – more SQL. Thursday evening we have the distinct pleasure of having Bob Hovious present to the Las Vegas SQL User Group. If I am not mistaken, this is his first time presenting to a SQL audience outside of a work setting. Bob is going to try and teach us about good design and proper datatype use. I think many a data professional could highly benefit from this type of presentation. As usual, we will have the presentation available for those interested in showing up in person as well as those who can only attend via the virtual world. Here are the details on how to attend. With the Move to Meetup, All of the Meeting information (abstract and bio) is posted there. The meeting location has changed. We will no longer be meeting at The Learning Center. New meeting location is M Staff Solutions & Training / 2620 Regatta Drive Suite 102 Las Vegas, NV 89128.
he event is sort of in Salt Lake City, being another 10-15 minutes south on the I-15 corridor. I will be presenting this year. I will also be attending to socialize, network, and learn some good stuff about SQL Server and about some other stuff. This year, the SQLSaturday SLC team is combining with Big Mountain Data to also provide topics on Big Data and other DBMS’s. If you are still on the fence about coming, check out this email that was just sent. We wanted to announce a new room/session that we will be holding at SQL Saturday this weekend. We’ve decided to open up a room all afternoon for open discussion. We will be asking specific speakers/experts in the field to help staff the room and help people with technical problems they are having. If you are currently evaluating new technologies or working on a big data initiative this is the place to discuss your ideas with some of the best in the business. They will give you honest feedback on things they have tried and ways to help design what you are looking for. The exact schedule for this room will be available at the event. This will only be scheduled for the afternoon of the event. If you were on the fence about coming to the event and not sure if you saw a session that really met your needs ask yourself if you’ve been in a position in the last few months where you would have loved to bounce and idea off someone or sat down with an expert to ask them what they suggest? This is the perfect chance to have those questions answered. I know there will be some top notch individuals (an MCM or three) manning the extra session. I have earmarked two sessions that I want to attend. One is by Argenis Fernandez (blog | twitter) and the other is by Kevin Boles (twitter). I will probably pop in and out of sessions otherwise trying to pick up as much as I can from several sessions. You can see the full lineup for the event here. Wow, more than two weeks past SQL Saturday in Curacao and I find a partially written wrap up post for Curacao in my queue. I had fully intended on getting this out much sooner than this. My apologies to those interested parties for the huge delay. Curacao offered an excellent opportunity (like SQL Cruise) to combine two things for me – SQL and Beach/Relaxation time. One of the first things you will notice if you attend SQL Saturday in Curacao is the beach and the serenity at oceanside. It didn’t take too long for Karla Landrum to ask about any lizard sightings. Karla was back home in Florida getting ready for SQL Saturday in NY. As one could imagine, it was necessary to help remind her of the lizards and particularly of Iguana soup. This particular guy was a little nervous and no intention of letting me teach him anything about SQL Server let alone have him over for lunch. On the flip-side though, this little guy felt it necessary to invite himself to my table for lunch. Curacao has some wonderful dutch influenced scenery. I only had a brief opportunity to take any of that in. But there is this floating bridge with a market that could be of interest if you make it down next year for SQL Saturday. With the sight-seeing out of the way, it was time to lay down some serious SQL education. We had some really good presentations by Bill Pearson, Rohan, Roy Ernest, Ignacio Salom and myself. Rohan and Roy also help run the local user group in Curacao. I had the distinct opportunity and pleasure to conclude the training with two sessions. Instead of doing two separate sessions though, we did a really long session on “Murder they Wrote”. The session is designed to discuss the top 10 methods to really kill your database. We had a fantastic time and the attendees were really engaged. I truly hope that it was as much fun for them as it was for me. I also hope that it was the educational experience they desired (I tend to think it was). We capped the event off with some speaker gifts and a group photo. Then it was off to visit with some of the attendees as we wound down the day and trip. The last pictures I took in Curacao are totally fitting in this spot. 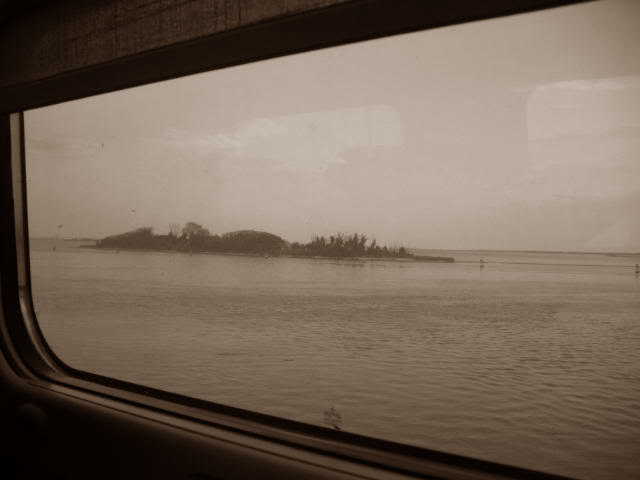 We see the sun setting on the island, just the same as it was setting on the short trip to the Caribbean. Mind you, all of these photos were taken with a phone and not a camera. The quality isn’t the best, but you get the picture. I enjoyed the time in Curacao. I enjoyed the opportunity to spread some SQL Learning. I enjoyed the opportunity to make new friends. 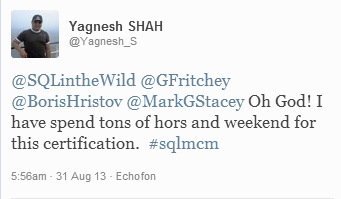 These are some of the things that SQL Saturdays are for me. Last picture was through the plane looking down into the Caribbean waters. Those are some really clear waters with great colors. 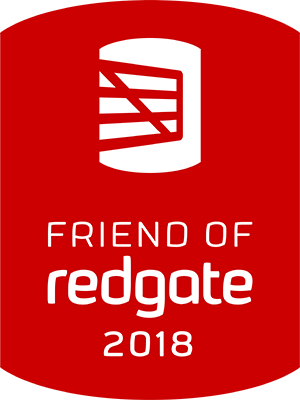 I hope to see you at a SQLSaturday soon!! I happen to know of two in the near future that I will be presenting and attending (Salt Lake City and Providence), hope to see you there. As of 11:04 PM MST ( -6 UTC ), the Microsoft Certified Master along with the other certifications in the Advanced certification series at Microsoft joined the ranks of the Panda on the Rare and Endangered Species list. The email is readily available on the web, and can be read here. I am not going to dive too deeply into the email other than to reiterate a comment that I made here about it. I am not happy about the decision. In part that is why I have waited a few days before writing up an article on the whole shenanigan. I was pretty ticked off about it in the first several hours after seeing the email. The community in whole also seems to share that same sentiment. Today, I want to share some of my thoughts on the whole certification thing. I want to share some of the community thoughts on the soon to be extinct certification. I also want to try and do all of this in an even keel. First some back story. Let’s revive some of my thoughts and perspectives on certification and training from past articles. When I first wrote about this, I called it a Stepping Stone Cert. That article can be found here. There is also a follow-up article here about it. This came about because of two fundamental reasons: 1. Cost of MCM and 2. lack of validity behind the MCITP/MCDBA/MCSE certifications. As far as the SQL MCM track goes, the first fundamental reason for that blog series was corrected. Microsoft opened up the SQL MCM to a broader audience by eliminating the 3 week rotation requirement and by lowering the cost (most of which was probably due to the 3 week rotation). Suddenly the MCM became much more attainable for somebody like me. I think that this barrier to entry is right sized now. I would probably still be happy with the cost if it were to be double the current cost (the cost is travel and exam costs for somebody like me). Could Microsoft take it up another notch? Probably. I don’t think I would be as miffed by the decision to raise the bar another level, as I was with the decision to try and force extinction on the MCM. The second reason has not been addressed in any manner in my opinion. 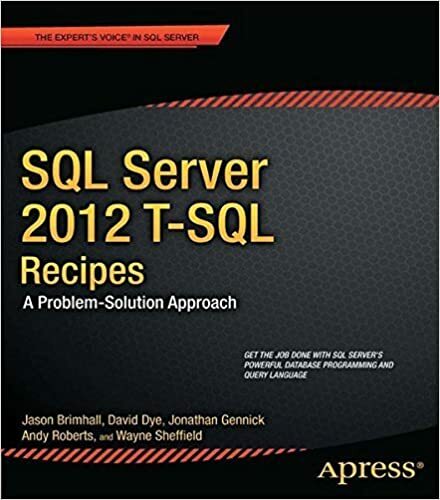 Since writing that series, I put myself to the challenge and took all four of the pre-requisite exams for MCITP SQL Server 2008. I took the exams without preparation and found them to still be excessively easy. Even going out on the web today, I can find plenty of resources for those exams that look like the exams I took. To me, this validates my concern as well as the concern of many who attained the MCM that the MCSE/MCITP/MCDBA is nothing more than a paper certification that can be far too easily braindumped. I will post some quotes along those very lines as well. I have also written about my disdain for many training facilities in the past. One such article can be read here. Part of the reason for that article was to try and make it to training by SQLSkills. They perform training that can be respected, unlike all of those MCSE farms out there that teach you how to pass the test and do nothing about teaching you valid SQL Skills. Sadly, I did not make it to that training offered with that contest, and am still seeking my first opportunity to attend. You can read my reasons for not having attended here. To belabor this point. That was not the only run-in I have had with a paper certified DBA. On other occasions I have been interviewing and received stacks of resumes from these Bootcamps. I have received numerous resumes for a Senior DBA role with “truck driving” or “rope making” as the only prior experience. While that doesn’t mean these people are not intelligent, they are in no way qualified to be a Senior DBA just yet. I don’t care what the bootcamp promises these people, a bootcamp is not experience and a MCSE/MCDBA/MCITP certification does not automatically equate to a Senior DBA. However, if you had an MCM apply for the job, that should equate to a Senior DBA. 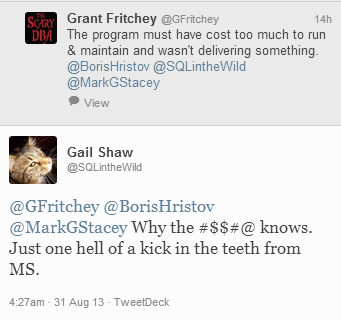 And no, just because one is an MCM does not mean we know everything about SQL Server. It does mean, however, that we are very good, seasoned and can figure it out quickly if there is something we don’t know. And I will take a moment for a sidebar here as well. Just because somebody is an MCM (or presenting or training) does not mean you have an opportunity to try and play stump the chump. If you engage in behavior such as that, you are pretty ignorant and crass. With some of that background out of the way, we can now dive into some of the aftermath caused by this announcement. References for these citations will be hyperlinks on the persons name or images of the citation in whole. That is just a few of the sentiments. Now let’s look at some of the comments from twitter on this affair. It should be understood that there would be an angry backlash when the “pinnacle” of Microsoft certification has been abolished. This is a sentiment that was echoed by Tim Sneath in his comments on the connect item when he called the MCM the vanguard. Microsoft has again enraged some of its most committed users, by “retiring” the Microsoft Certified Master (MCM), Microsoft Certified Solutions Master (MCSM), and Microsoft Certified Architect (MCA) certifications. It should be abundantly clear that this decision is driving a wedge between the “most committed users” and Microsoft. Not in the decision itself but also in the way that it was executed. Sending the news out at 10PM PST (-7 UTC) is being viewed as nothing more than a means to try and mute the criticism. Instead, the criticism has boiled over and many in the community are unhappy with Microsoft, Microsoft Learning, and this decision. A DBA of 14 years is disheartened to the point to change career paths and goals? Does Microsoft really want to push away the committed users in this fashion? Tim posted several possible reasons for the need to pause the MCM program in a post on the connect item. There has been some feedback and some of it nastier than other feedback. Two of the big driving factors that seem relevant from his comments are: 1. Traction and 2. Cost. It was also stated that there was months of deliberation on the topic. I don’t think Tim is fooling anybody with that statement. There is evidence that Microsoft continued to take money for rotations starting in October as late as last week. This seems to be a bit of back-pedaling in a cover up at the very least to try and take some heat off the decision. As per the two semi-coherent reasons for canceling the advanced certifications, the only one that seems to hold water is cost. I don’t buy into the barriers to entry (as is the case for others per their responses on the connect item). I don’t buy into the traction issue. Tim stated that .08% of MCSEs go on to become MCM. For Microsoft that seems to be a bad thing. For the rest of the world, this seems to be a good thing. This is the peak, pinnacle, vanguard we are talking about here. Can you have a peak that contains 10% of your certified user base? That seems more like a saddle than a peak to me. With .08% traction, that is a good thing in my mind. I have seen plenty of potential clients demanding an MCM. Sure, they may not have known what an MCM is/was last year, but we are in a changing landscape and people know what the certification represents. If Microsoft wanted better traction, I think they should have done some of the things that Greg Low has pointed out in the connect item. Speaking on the Gold Partner program, there was apparently some inconsistency there with that as well. For instance, I know some cases where the Gold Partner did not account for the MCMs on staff and in some cases where the “partner” was informed that the MCM would count. If it doesn’t count (for Gold Partners), how can one expect there to be a more broadened traction with the advanced certification? Is it just endangered or is it dead? So far, it has been pretty much doom and gloom. There are some out-crying for a refund (some should and some are just being pithy). Microsoft gave us a pretty absurd announcement and it was poorly executed. In no way would many of us be able to retain a client with an announcement executed in the same manner that was done by Microsoft Learning. We have solely focused on the “supporter” side of the fence and how this announcement affects us. Very little has been said concerning how this affects those at Microsoft Learning that received the news in similar fashion and who may be without a job in 30 days. There is a possible light at the end of the tunnel. I will remain cautiously optimistic about the program being revived. I do not expect it to happen and will be happy if it comes back to life. That comes with a warning though. If the program is anything less than the current program, it will be met with disdain by the community and I dare so by Corporations globally. but the knowledge and skills each MCM has gained is invaluable. We can continue to serve our clients better. And maybe that will be in spite of Microsoft Learning. Microsoft has said we will continue to be charter members. That’s cool and all, but it probably won’t hold water with any client that checks the Microsoft Learning website and is unable to find MCM or MCSM anywhere. I know the characteristics of many of the MCM and I am fairly certain that there is one thing this announcement will not change. Those who have the drive and passion for SQL Server and attained the MCM, also have a drive and passion for continued education. We will continue to dive deep into SQL Server. We will continue to push ourselves. We will strive to continue to provide top notch service to our clients or employer. That is just who we are, and the removal of this certification will not change that. 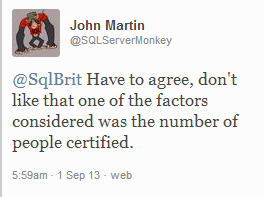 I do fear that the loss of this certification will continue the big brother psychosis in the DBMS world though. There will be a perpetual “Oracle has a certified Master” or “Oracle has this” and Microsoft will be in the Oracle shadows for a while to come because of it. We don’t see Oracle abandoning their pinnacle certification. We don’t see Cisco abandoning their pinnacle certification. And I am certain it is no less costly to them than Microsoft, nor is it anymore profitable to them than it is Microsoft. Is Microsoft Learning ready to latch tight to the MCSE that is poorly regarded through the Community and Corporations worldwide? If relationships matter most, I would hope that Microsoft Learning does not abandon this relationship with the MCM and their most staunch supporters/evangelists. In concluding this long diatribe, I welcome all MCMs to show their support at Summit 2013. We are planning on wearing the robes of the Jedi in tribute to the MCM. The initial idea was by Robert Davis, and we are trying to run with it now. One thing remains certain for me, Microsoft cannot change my license plate or that I have earned my MCM!! The following two images are courtesy of Robert Davis.